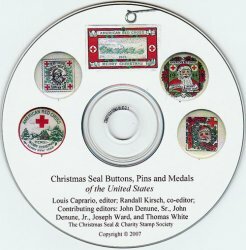 U.S. Christmas Seal Buttons, Pins, & Medals, 2007 ed., CD. Includes information on National issues, modern health crusaders, locals & Congresses, includes many Red Cross pin backs. Published by the Christmas Seal and Charity Stamp Society (CS&CSS). U.S. Christmas Seal Buttons, Pins, & Medals, 2007 ed. on CD. Published by the Christmas Seal and Charity Stamp Society (CS&CSS), Louis Caprario, editor. Includes information on National issues, modern health crusaders, locals & Congresses, includes many Red Cross pin backs. Catalogs are in MS Word and pdf format, all images are in full color, over 80 pages, 2007. Requirements: MS Word 2003 or higher and inkjet printer.